India and Russia have agreed to set up a joint study group to examine the feasibility of a free trade agreement (FTA) to boost bilateral trade and investment flow. Russian Deputy Prime Minister Dmitry Rogozin’s two-day sojourn to India this week acquires significance in view of the fact that it is the first high-level visit from Russia following the bilateral summit between Prime Minister Manmohan Singh and Russian President Vladmir Putin in October last year. A renewed focus on key areas of convergence -- trade, defence, space and nuclear energy – to bolster bilateral relations were on the table for discussion. Also high on the bilateral agenda was the long-pending deal for the third and fourth reactors of Kudankulam Nuclear Power Plant (KNPP) which Russia helped build in the southern Indian state of Tamil Nadu. The plant is part of a bilateral roadmap signed in 2010 to construct 14-16 nuclear power plants across India. A consensus was reached to break the protracted deadlock over a stringent Indian law governing nuclear accidents that makes suppliers of nuclear fuel liable in case of a mishap. Moscow is disconcerted about the project coming under the ambit of the Nuclear Civil Liability Law of India, rather than the inter-governmental agreement on the issue, which will reduce the latter’s vulnerability in the eventuality of a nuclear mishap. New Delhi has tried to assuage Russian concerns by making fresh proposals on the liability factor, limiting it to suppliers default in cases of equipment failure. A swift conclusion to the KNPP deadlock, both parties agree, is pivotal not only for the furtherance of the bilateral agenda in the arena of nuclear energy, but is also key to tackling the needs of an energy-starved India. The country is battling sundry bottlenecks in energy supplies which are stalling projects and worsening GDP growth that has plummeted to a decadal low. 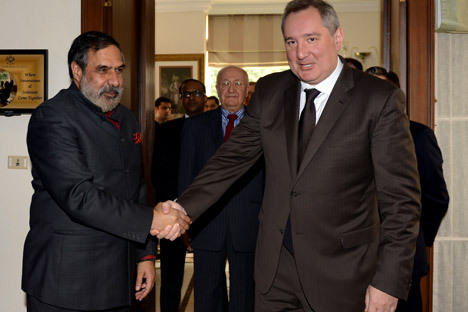 Rogozin, who also chairs the India-Russia Inter-Governmental Commission (IRIGC) -- the apex forum for bilateral economic cooperation – met India’s Minister for Commerce and Industry Anand Sharma and External Affairs Minister Salman Khurshid. Following the meetings, India and Russia have agreed to set up a joint study group to examine the feasibility of a free trade agreement (FTA) to boost bilateral trade and investment flow. The possibility of launching the production of Russia’s Sukhoi SuperJet 100 and ÌS-21 aircraft in India was also discussed. The proposed FTA is to be signed between India and the Customs Union of Russia, Kazakhstan and Belarus. India has been pushing for a study group for some time as an FTA with Russia could help whittle down its economic dependence on the US and the EU. India, on its part, has agreed to formally discuss Russia’s interest in joint production of its civilian aircraft in India either in the working group on trade and economic cooperation or sub-group on civil aviation. Both sides also reviewed the progress of identified ‘priority projects’ which include establishment of joint stock Indo-Russian enterprises for manufacturing light helicopters and plant construction for manufacturing butyl rubber at the production site in Jamnagar in the western Indian state of Gujarat. Possibilities of cooperating on space applications, including use of GLONASS for tracking navigation of heavy trucks and other services, were also discussed. GLONASS is an alternative to US-run Global Positioning System (GPS). India is the only country to which Russia has consented to give exclusive access to GLONASS military-grade signals, which will help the country’s defense forces enhance the accuracy of their land-, sea-, air and space-launched weapon systems. Progress on the decision taken last year to set up a joint study group for an oil pipeline from Russia to India across the former Soviet Central Asia, Afghanistan and Pakistan was also reviewed. The unobstructed pipeline from Russia to India will run parallel to TAPI, the $7.6-billion Turkmenistan-Afghanistan-Pakistan-India gas pipeline, and bestow similar economic advantages to countries through which it would pass. While optimism is guarded in New Delhi on the pipeline’s idea, the enormous benefits it would endow upon an energy-deficient India, observe analysts, is what makes the project worth exploring. The project also has the potential to significantly enhance the volume of bilateral trade which currently stands at $7.8 billion. Bilateral relations between Russia and India straddle diverse sectors from defense, space and nuclear energy to exchanges in the commercial, educational and cultural fields. The two regional actors have built a firm bedrock for an enduring partnership to tackle the challenges of the modern age.